Lovely room, lobby and breakfast area. All very well presented. Attached coffee shop serves great food and coffee, perfect brunch type place. Located a 5 minute walk from St Peter's Square. Friendly staff. The interior design is stunning, making the place feel elegant but comfortable. Roght next to the Gay village, and few minutes walk from both main stations it's a perfect location to explore the city. The Foundation coffee shop on the ground floor serves food breakfast and lunch. So comfy and the decor is so relaxing. Chilled our wine and cooked a snack. Perfect ! The staff were brilliant and incredibly helpful. They gave us recommendations for places to go and things to do. There was also complimentary yoga classes available. Good welcome pack in the room was a nice touch, as were the little notes around the apartment. Great welcome, Emily was a superb hostess. Nothing was an inconvenience. The room is so very thought of and to the high standard for interior design. 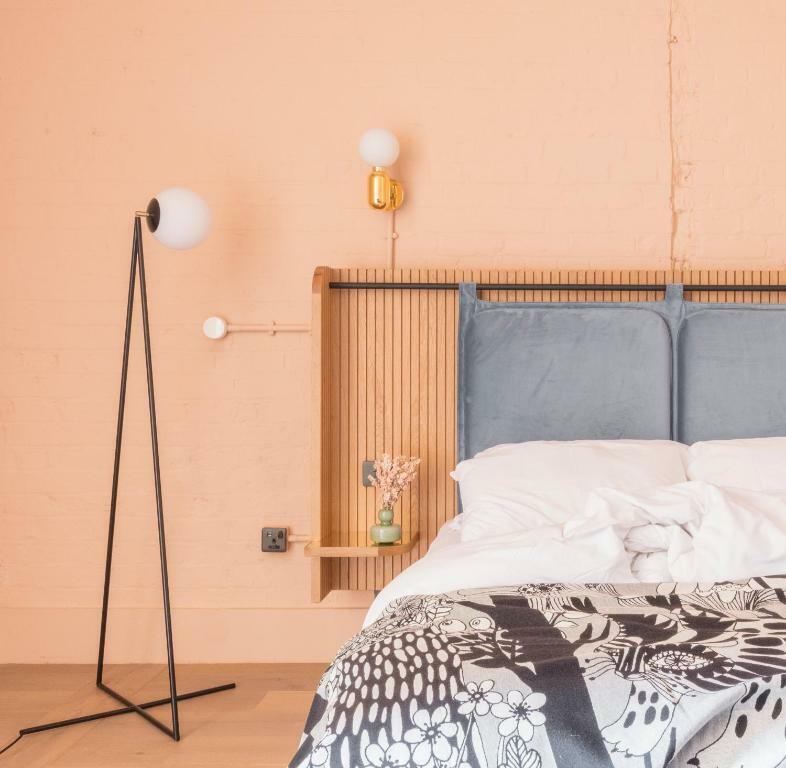 I am an interior designed and i love all the details from the colour of the wall to the kitchen, bed and tiles! The cafe area at the back and the bar area are both very nice. people love having coffee and study/read in the chill out area. It's so well designed. The staff at reception are super friendly and helpful. We left our t-shoirt in the bar area, and Alexander helped finding it and post it to us back to our home. Also liked the idea of sneaky peak into the show room, take a look! I love the hotel, the neighbourhood and the nightlife in the area. I'm very happy to say that this place is great. 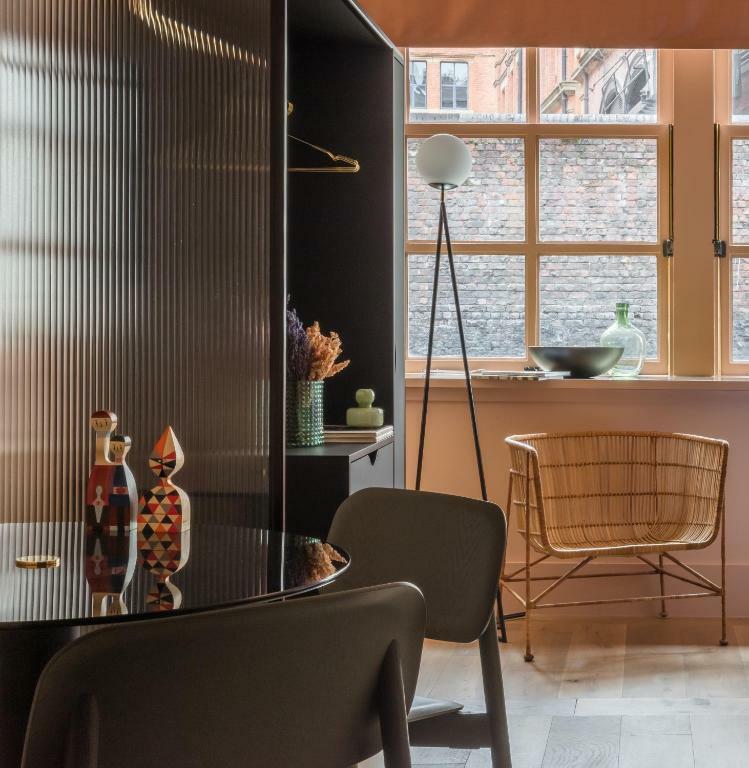 Recently refurbished, it's extremely style-conscious. The bar/cafe and co-working space on entry are warm and welcoming, as were the staff who were extremely helpful and genuinely interested in having a conversation when we arrived. The rooms are also well designed, and have made the best out of an old building with modern furnishings and colour schemes. Location-wise it is in the heart of the city, at the halfway point between the universities and the more commercial/foodie side of the city - a great to walk to either from. Lock in a great price for Whitworth Locke - rated 9.5 by recent guests. 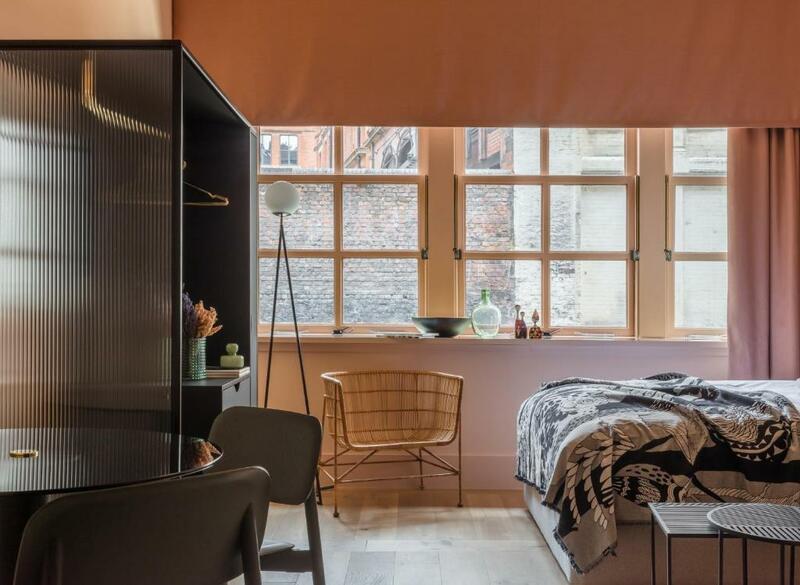 Located in a 19th-century building in Manchester’s civic quarter, Whitworth Locke has accommodation with free WiFi. It is just minutes from the city’s famous Northern Quarter - home to independent shops, bars and restaurants, 200 yards from Canal Street and 350 yards from The Palace Theatre. The units come with parquet floors and feature a fully equipped kitchen with an oven, a dining area, a Smart TV with easy media streaming, and a private bathroom with bath or shower and free toiletries. A microwave and kettle are also offered. Guests can also relax in the shared lounge area and inner atrium which offers co-working space and a coffee shop and bar. With every booking guests will receive 15% off beverage discount at The Conservatory Bar located at Whitworth Locke. Bridgewater Hall is a 6-minute walk from Whitworth Locke, while Manchester Central is 700 yards away. The nearest airport is Manchester Airport, 8.1 miles from the property. Whitworth Locke has been welcoming Booking.com guests since 1 Oct 2018. When would you like to stay at Whitworth Locke? 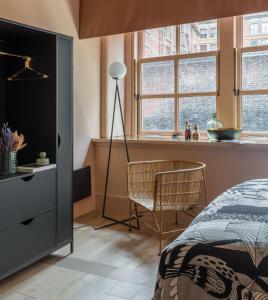 Micro-studios offer comfort, style and value in an average 24m^2 of meticulously designed space. These apartments are ideal for shorter stopovers or longer stays for one. The open-plan living space includes a kitchenette, private bathroom, and a king-size bed worthy of a lazy morning. They are kitted out with private hyper optic WiFi, a Smart TV and Apple TV box, with content streaming functionality. 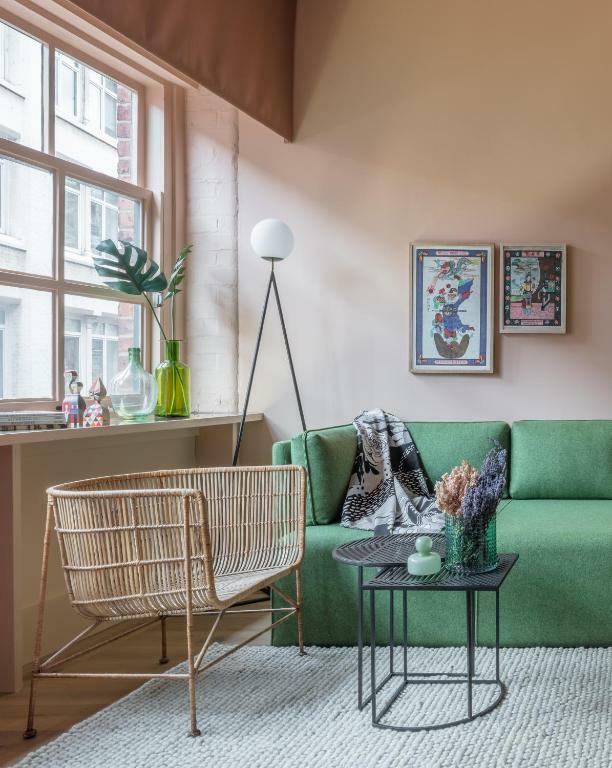 These open-plan studios offer stunning yet functional interiors that reflect the local area. The studios offer an average 32m^2 of space, with high speed WiFi, a Smart TV, Apple TV box, L-shaped sofa and king-size bed. 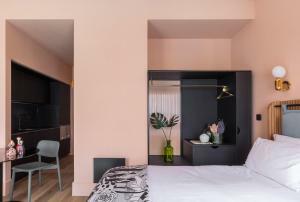 With a private bathroom and kitchenette, our studios have everything needed for a city stopover or a longer-term stay. These fully accessible twin studios have been intelligently crafted by New York Design team Gryzwinski+Pons, with quirky yet functional interiors that reflect the heritage of Manchester. The spacious studios offer high speed WiFi, Smart TV and an Apple TV box. The living space features a L-shaped sofa with a double or optional twin beds. The private bathroom features a powerful shower, and kitchenette includes an oven and fridge. Ideal for a city stopover or longer term stay. Each 1 bedroom suite is unique, preserving its original quirks that reflect the building’s 18th century heritage. With an average 38m^2 living space, these spacious apartments are ideal for long stays. The living area features a kitchenette, work space, deep green custom-designed sofa and all the tech you need, including high speed WiFi, Smart TV and an Apple TV box. In the separate sleeping area is a plush king-size bed and open wardrobe, in addition to a spacious bathroom. 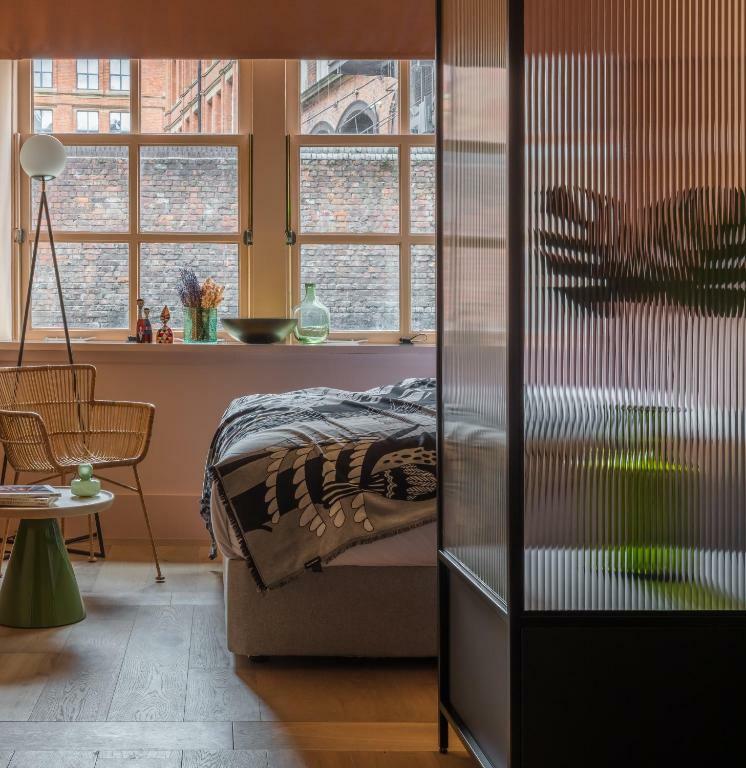 The Whitworth studio suites are distinguished by their original 18th century heritage features, exposed brick walls, and designer furnishings curated by renowned architects Gryzwinski+Pons. These superior studios offer a generous 34m^2 of space, with a king-sized bed and separate living area. Whitworth studios are kitted out with full kitchens including oven, dishwasher and washing machine, a plush green sofa, and spacious bathroom with walk-in power shower. The living space is equipped with modern tech, including high speed WiFi, a Smart TV and Apple TV box. This 1 bedroom duplex suite is one-of-a-kind at Whitworth Locke, with everything you need to live comfortably in 38m^2 living space. The spacious suite is equipped with high speed WiFi, a Smart TV and Apple TV box. a comfy L-shaped sofa, work space and a kitchen with a dishwasher and washing facilities. The separate sleeping area features twin queen-size beds, and the spacious private bathroom comes with a walk-in power shower. This spacious 44m^2 suite is one-of-a-kind, with 1 king-size bedroom and a smaller, adjoined twin room. The livings space features a kitchen with everything needed for family living, including utensils, an oven, fridge/freezer, dishwasher, and washing facilities. 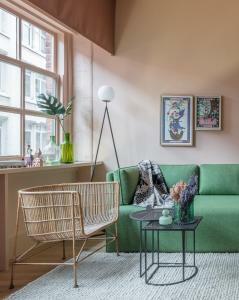 There’s a green L-shaped sofa, a large kitchen table and spacious private bathroom. The suite has all the tech needed to entertain, including private hyper optic WiFi, a Smart TV and Apple TV box. 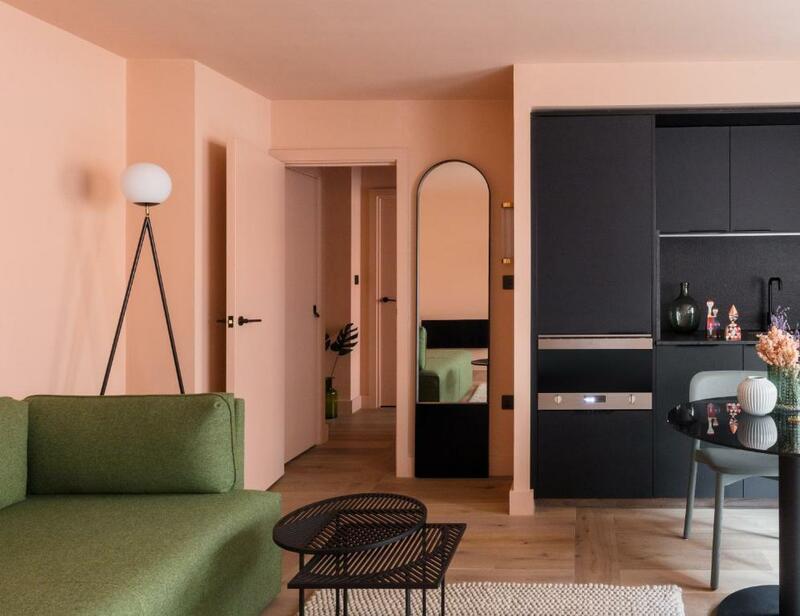 The 1-bed apartments are open-plan and offer all the necessities for a long term stay with a smart TV, well equipped kitchen, living and dining area. 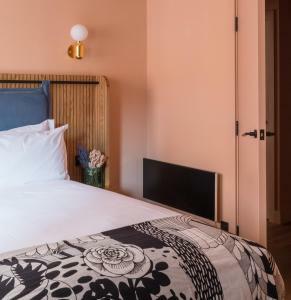 The bedroom is in an adjacent space and the spacious separate bathroom has the property's bespoke Kinsey Apothecary Salted Carmel and Vanilla body wash.
House rules Whitworth Locke takes special requests - add in the next step! Whitworth Locke accepts these cards and reserves the right to temporarily hold an amount prior to arrival. A security deposit of GBP 200 is pre-authorised at the time of booking for incidentals. This deposit is released back into your card after check-out and subject to a damage inspection of the accommodation. Not any worthwhile breakfast deals between the hotel and attached coffee shop. In our room there wasn't a big bright lamp, especially the kitchen area was quite dark. In all honesty there isn’t anything that could be changed. Our view looked out over a car park, but with a city centre hotel there isn’t much you can do about that and it certainly didn’t detract from our experience. Better lighting in the entrance and dining areas. Quite dark in the room , small window. Spacious studio apartment with fab decor. Friendly staff. Nice bar. Great to have Foundation Cafe on site. Everything was great. The view from our room wasn't amazing, but everything else more than made up for this. nothing major. minor minor thing, the socket in the bar area is well hidden at the bottom and hard to reach. No coffee in the room for the morning but we didnt arrive until late at night and didnt notice until we had packed on the morning and was going to have a coffee, I am certain if we had of mentionned it we would of been given some as all of the staff where friendly and attentative. No aircon. Noisy with windows open. Would seek quieter room next time. Very smart, beautifully renovated building.